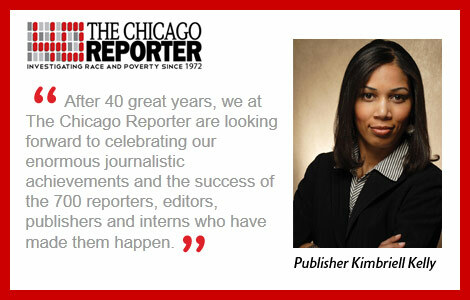 Chicago, Ill.—One of the nation’s most successful investigative publications, The Chicago Reporter, made two announcements today: the launch of its year-long 40th anniversary celebration and the naming of its newest publisher, Kimbriell Kelly. In the issue published today, The Chicago Reporter continued its mission of documenting the city’s struggles with race and poverty with an investigation of the management failures of Chicago’s public housing authority. At a time when the public housing waiting list nears 40,000 families, nearly one in five public housing units are vacant. The Chicago Housing Authority has one of the highest rates of unoccupied units in public housing across the United States. Published by the Community Renewal Society, the bi-monthly magazine and its website are “must reads” for legislators, policy makers and academics, attorneys in the Department of Justice as well as the Illinois Attorney General’s office, anyone who cares about the social justice agenda in Chicago and nationally. Among its subscribers and financial supporters have been President Barack Obama and his senior advisor, David Axelrod. Over the last four decades, The Chicago Reporter’s investigations have had major impacts at the national, state and local levels and its staffers have won numerous awards, including the Sigma Delta Chi Award for Public Service from the Society of Professional Journalists, the Clarion Award, dozens of Lisagor Awards and a series of Kogan Awards from the Chicago Bar Association. The new publisher, Kimbriell Kelly, has been serving as editor of the magazine since 2008 and interim publisher since fall 2011. She joined The Reporter staff in 2004 as a McCormick Fellow in urban affairs reporting. The year long celebration will kick off on July 13th with a private reception on the Chicago Public Radio terrace at Navy Pier. Forums on criminal justice and public housing are planned as is a show in collaboration with NPR’s “Wait Wait…Don’t Tell Me!” in the spring of 2013. Perhaps the Reporter’s most widely known investigation was reported by Kelly. The story, “Costly Choices: Lending Disparities Continue for Blacks,” led to an $8.7 billion national settlement in 2008 against Countrywide, the nation’s largest mortgage lender and servicer, for its unfair lending practices to minorities. Ten states joined the settlement, which allows up to 400,000 homeowners nationwide, nearly 11,000 in Illinois, to modify their loan terms. The Reporter’s work was cited again in 2011 in a $335 million settlement between the U.S. Department of Justice, Illinois Attorney General Lisa Madigan and Countrywide over discriminatory lending. According to The Washington Post, the settlement was the largest ever for fair-lending claims and Countrywide’s discriminatory practices stretched across 41 states and the District of Columbia. At issue, Countrywide Financial unit charged black and Hispanic borrowers higher mortgage fees in the lead up to the financial crisis and steered them into riskier loans than their white counterparts. Founded in 1972 by John A. McDermott, The Chicago Reporter launched at a time when Chicago, as well as the rest of the nation, struggled to come to terms with the gains of the civil rights era and the resistance that followed. With marches and lunch counter protests coming to an end, McDermott decided that people needed facts. While still in its infancy, in its trademark style of dispassionate but exhaustive reporting, The Reporter broke dozens of stories documenting widespread discrimination against African Americans in corporate hiring, city services and governmental affairs. More recently, its stories have tackled the disparities in nursing home treatment of black and white seniors, and overly harsh sentencing for African American offenders as compared with whites convicted of the same crimes. Over the last two years, The Reporter has aligned its operations with high-profile media organizations to expand its reach. Partners include The New York Times, Chicago Public Media, NBC, the Huffington Post, FOX, WVON, Tribune Media and The Media Consortium.